Oracle APEX 18.1 has many new features, one of them is called Social Login. On the World Cup 2018 Challenge, you can see the implementation of this new feature. 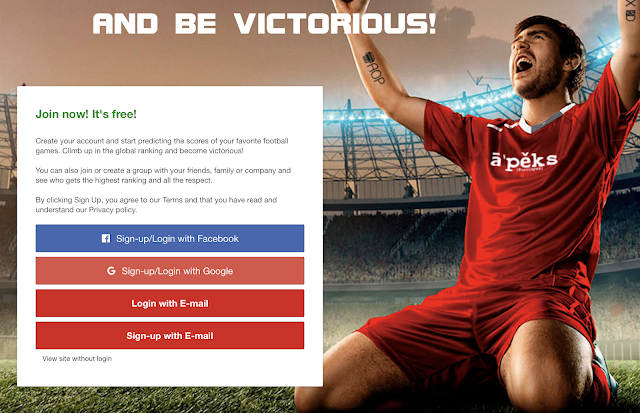 The site allows you to sign-up or login with Facebook, Google, and your own email address. It's even nicer that if you register with your email, but later decide to sign-up with Google or Facebook, it will recognize you as the same user if the email address is the same. To enable Facebook login in your own app, you first have to create an app on Facebook. Creating an application is straightforward by following the wizards, just make sure you create a website app. To enable Google login in your own app, you first have to create a project on Google. Adrian did a really nice blog post which walks you through creating your project and setup Google authentication in your APEX application. To hook-up Google and Facebook to our own APEX app, we have to let APEX know which credentials it should use, namely the info you find in the previous screenshots. I added the Web Credentials for Facebook and Google. Web Credentials store the necessary info (Client ID = App ID and Client Secret = App Secret) of the OAuth2 authentication. OAuth2 is a standard these days which most sites are using to authenticate you as a user. 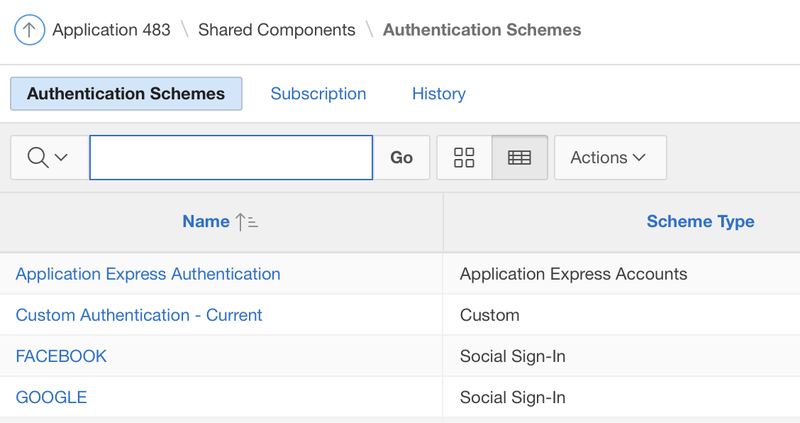 Web Credentials are stored on Workspace Level so you can reuse those credentials in all the APEX apps in the same workspace. We need to create the different authentication schemes. The Custom Authentication is to authenticate with email, next we have FACEBOOK, and GOOGLE (and Application Express Authentication which is there by default, but not used in this app). 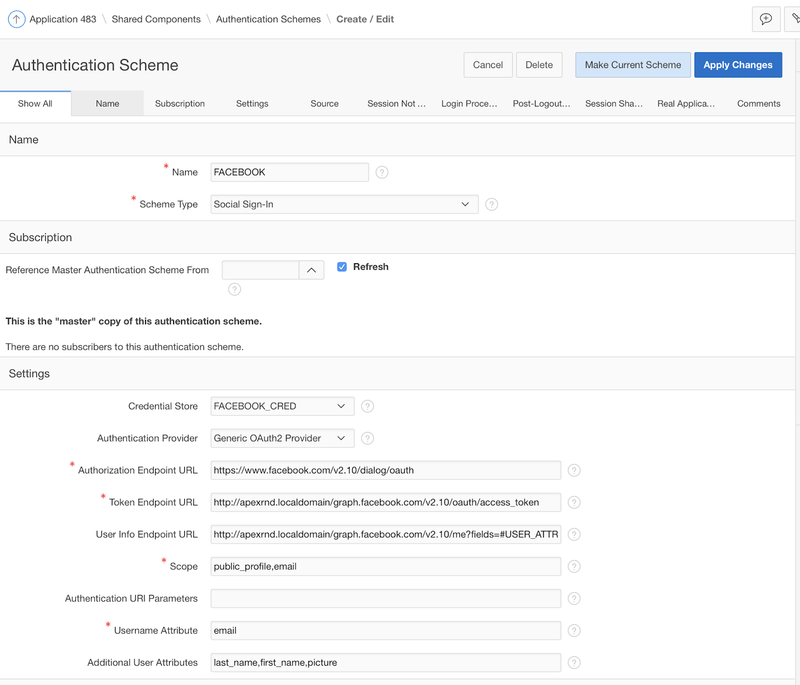 I blogged before about Create a Custom Authentication and Authorization Scheme in Oracle APEX. The package I use in that blog post is pretty similar to the one of the World Cup app. In the Authentication Scheme, you define the authentication function. I also have a post-authentication procedure that sets some application items. Normally the authentication scheme of Facebook would look a bit different as Oracle APEX has built-in Facebook authentication, but for that to work, you need to load the SSL certificate in the Oracle wallet. On the platform the World Cup is running, the database is 12.1 and unfortunately, there's a bug in the database with multi-site or wildcard certificates (which Facebook has). So I had to workaround the issue, but I still used a new feature of APEX 18.1, instead of Facebook Authentication I used Generic OAuth2 Provider. To get around the SSL issue I set up a reverse proxy in Apache which handles the SSL, so anytime the database does a call to http://apexrnd.localdomain it goes through the reverse proxy. Note that in Oracle DB 12.2 and above the SSL bug is not there, so you don't need to do the above. I've been using the technique many times before if I don't want to deal with the SSL certificates and configuring the Oracle wallet. 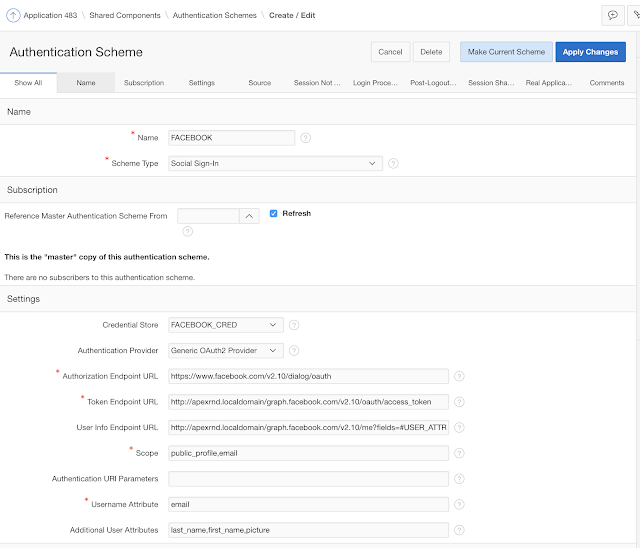 Adrian did a post about APEX Social Sign-In without a wallet, which might be of interest if you are on Oracle XE for example. So what else is happening in the authentication scheme? You have to give the scope of what you want to get back from Facebook. In our case, we use the email as username and for additional attributes, we also want to know the first name, last name and the picture. It's really important you set those additional attributes, otherwise, APEX won't pass the full JSON through and takes a shortcut as it just needs the email. Special thanks to Christian of the APEX Dev team, without his help, I wouldn't have figured that one out. Thanks again, Christian! The next big bit is the post_authenticate procedure which contains the logic to map the Facebook user to the World Cup app user. 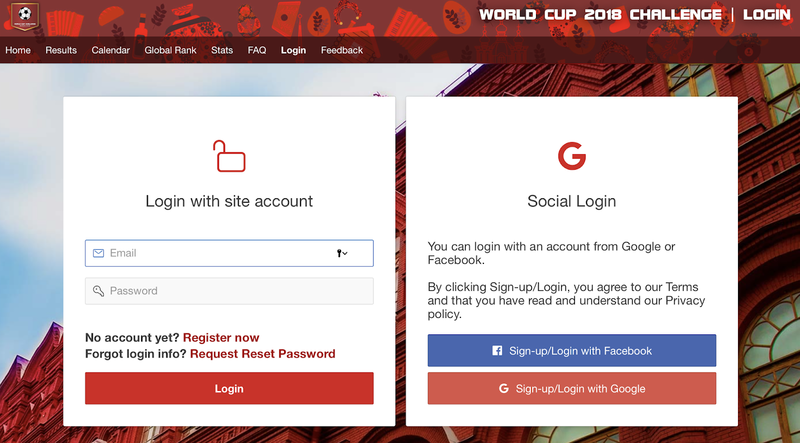 If it finds the user, it will set some application items again, just like in the custom authentication, but if it doesn't find the user (the first time somebody connects through Facebook), it will create a World Cup user. The most important part of that logic is the part to get the name and picture. Here we parse the JSON the authentication scheme holds in memory. And then the final bit you have to be careful with, that in the authentication scheme "Switch in Session" is set to "Enabled". This setting is the magic bit to have your APEX application multiple authentication schemes and be able to use one or the other. 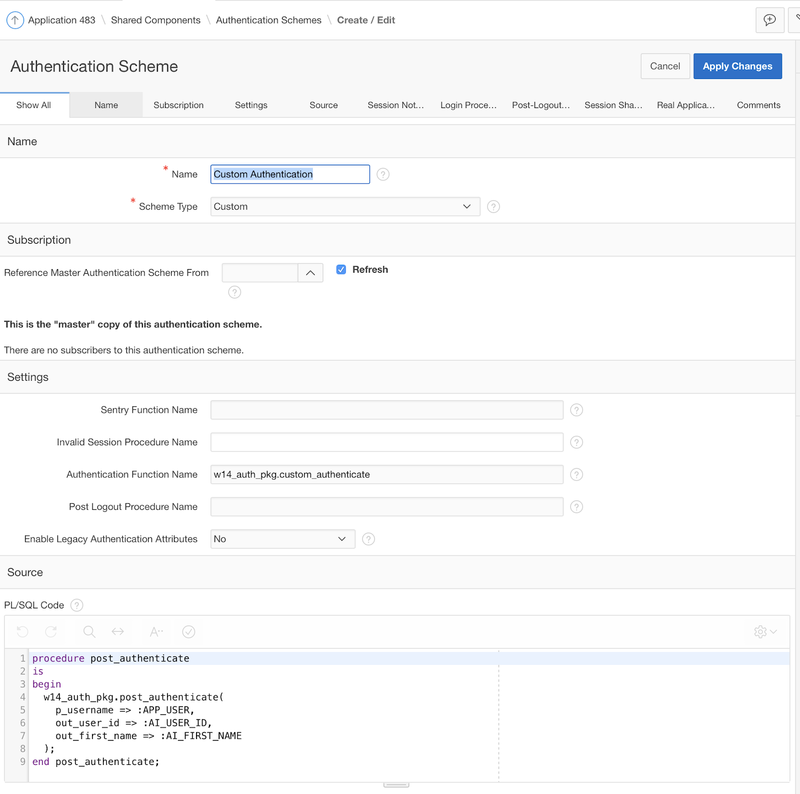 The Google authentication is simpler than the Facebook one, as we don't have to do the workaround for the certificate as Oracle understands the Google certificate. 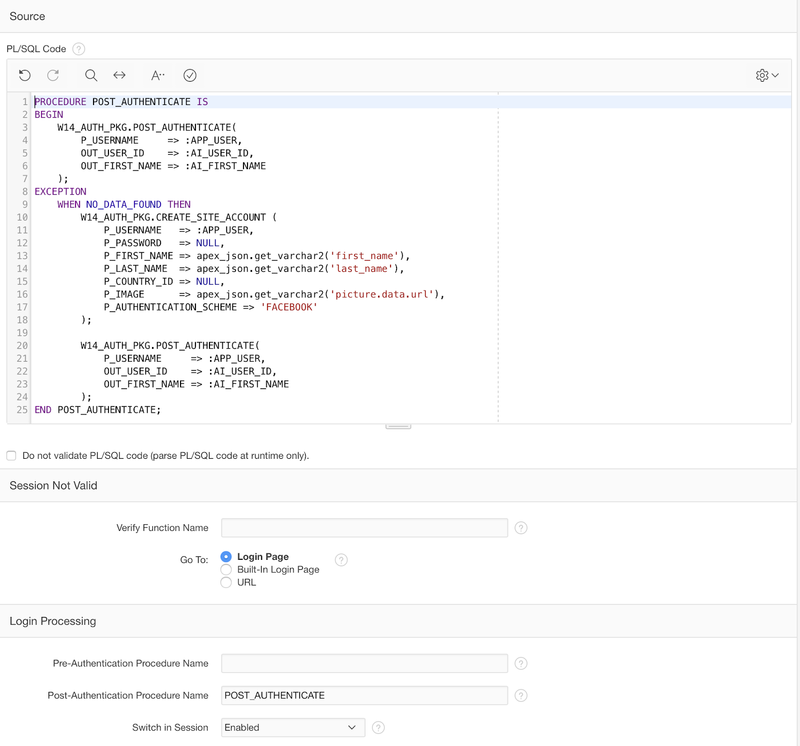 So here I use the standard APEX 18.1 feature to authenticate against Google. The username attribute is again the email, and the "additional user attribute" is "profile" as that holds the name and picture of the person. The rest of the authentication scheme is very similar to the one of Facebook. Again don't forget to switch in session to enable. The Login button is a normal Submit and will do the Custom Authentication as that is the default authentication (see - Current in Shared Components > Authentication Schemes). 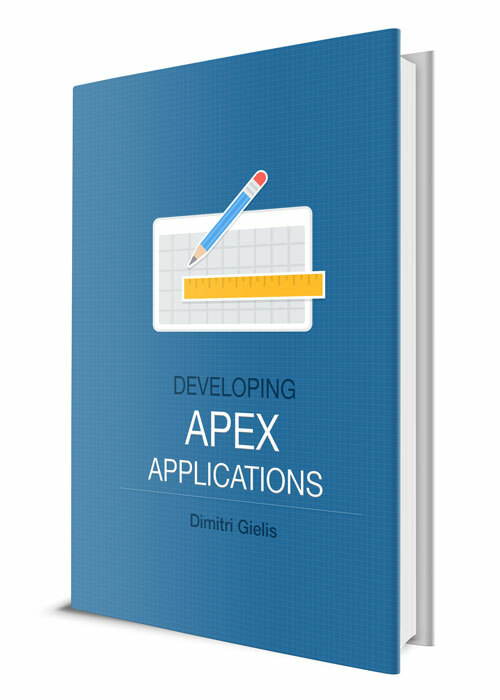 I hope by me showing how the Social Authentication of Oracle APEX 18.1 was implemented in the World Cup 2018 Challenge, it will help you to do the same in your own APEX application. I really love this new feature of APEX 18.1. 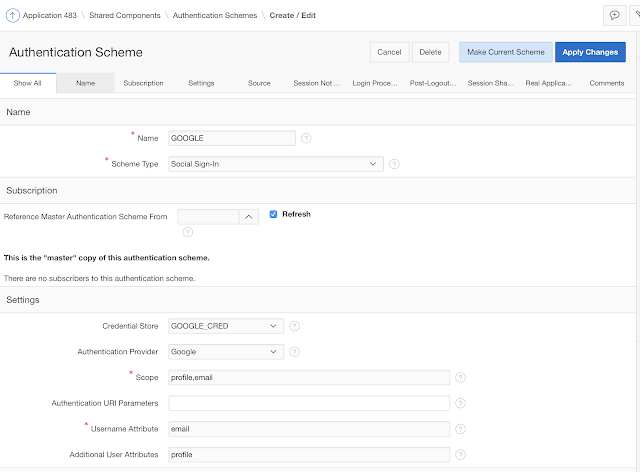 The implementation is very elegant, user-friendly and flexible enough to handle most of the OAuth2 authentications out there. Note that Facebook and Google upgrade their APIs to get user info, so depending on when you read this, things might have changed. 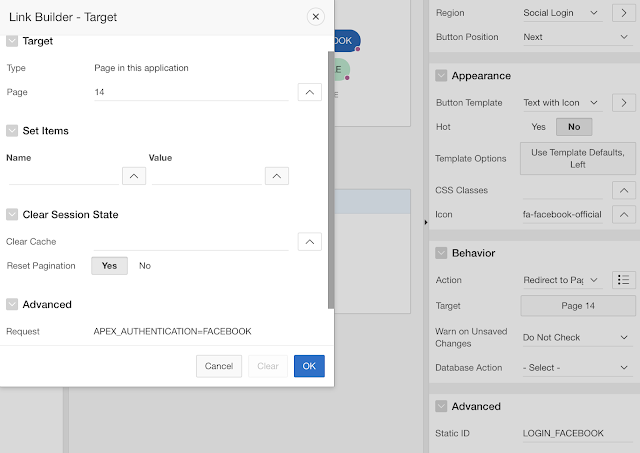 Facebook is typically backward compatible for a long time, but know that the current implementation in APEX is for API v2.10 and the default Facebook authentication is v3.0. As far as I experienced, the user info didn't change between the API versions. I'll do another blog post how you can debug your authentication as it might help you get other info than the one I got for the World Cup app. Feel free to add a comment if you have any question. I am getting this error when i am trying to login with google. Click here to create a new session." I was able to resolve the error i reported earlier however I am facing this error now "API calls from the server require an appsecret_proof argument". If I disable the "Require App Secret" in FB apps then its working but not when it is enabled. Suggest me some solution for this please. im getting the below error while applying the facebook authentication can you help?